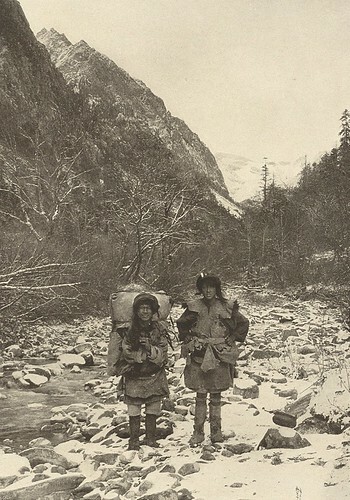 Summary: After Cizhong, Joseph Rock headed west, crossed over the 15,000 foot high Sila pass to the Salwin river [now known as the Nujiang 怒江] and explored some of the monasteries and towns there. He then returned to the Mekong via a treacherous gully he called the Londre gorge. And finally he made another westward excursion to climb the now famous Doker La [多克拉] pilgrimage trail that traditionally marks the border point between Yunnan and Tibet. 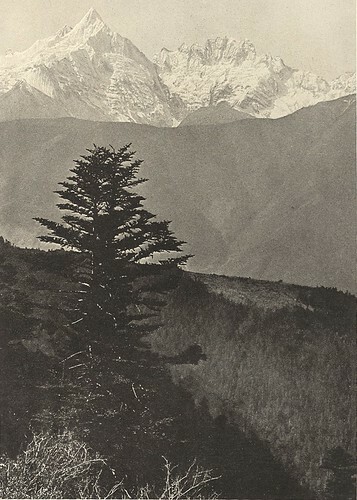 There he caught glimpses of the southern end of the 6740 m Kawakarpo mountain range, which he later viewed and photographed from what is now Deqin 德钦 - then known as Atuntze. Leaving most of his supplies behind he ascended first from the Mekong river up a steep zig-zagging track through oak and pine forests to a ridge about 11,000 feet up. From here he had great views of the Baimashan mountains south of Deqin. Continuing up to the bleak Sila pass, he passed through deciduous forests of maples, with wild cherries and rhododendrons growing in the bush. And again there was that beard-like lichen covering the trees as is seen throughout much of Kham. The next day he crossed the Sila pass in a snow storm, but not before seeing a triangular overhanging peak to the north. From here they descended into the Salwin valley and to an even more remote Christian missionary outpost known as Bahang, or Peihanlo in Chinese. A well-made trail had been constructed under the instruction of the French missionaries who manned this most lonely and remote spot. 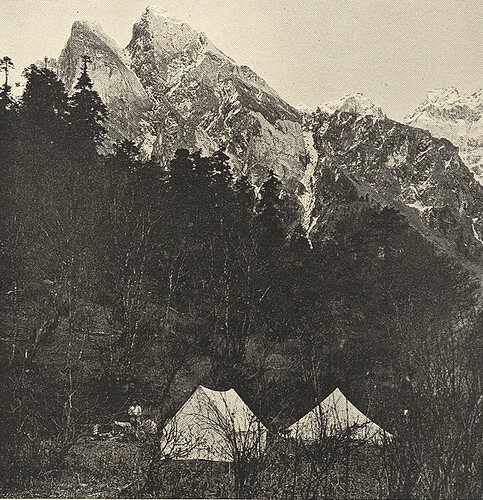 First, though Rock had to cross some subsidiary ridges and tributaries that flowed into the Salwin - the Sewalangba and Doyonlangba rivers, where they stayed in a mountain hut which may well be the one that trekkers still use when crossing this route. 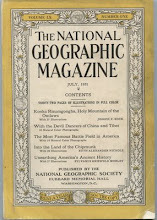 For a map of this route and account of one American's crossing of it you can link here. On a bluff above the Doyonlongba Rock finally reached what he described as "the loveliest mission station of which I know" - Bahang. 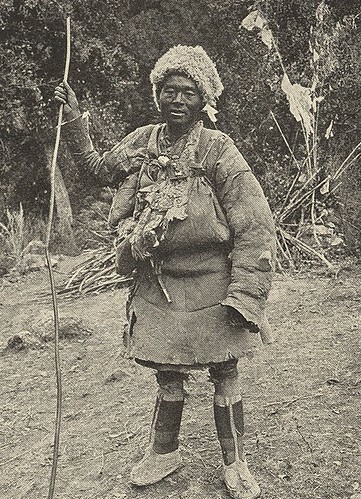 The "Lutzu" people that Rock encountered in the Salwin (Nujiang) valley he described as a poor lot who subsisted on corn, even using it to make liquor "of which they drink a great deal". 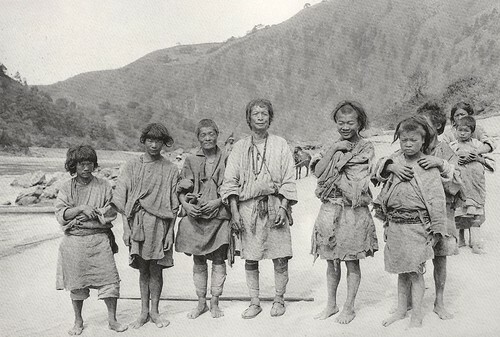 Some Lutzu people Rock encountered in the Salwin [Nujiang] valley. 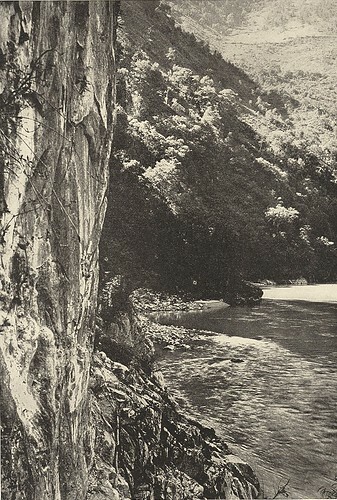 Rock continued on up the Nu river, first to Chjonra [across the Nu river from the present location of Gongshan 贡山], where he encountered a drunken gathering to celebrate the sale of a woman to become one of the many wives of a local Lutzu man. The inebriated locals ferried Rock and his helpers across the Salwin in dugout canoes. 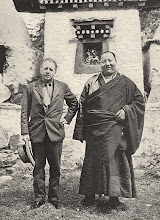 Continuing north, he arrived at the burnt out monastery of Champutong [perhaps the present day Bingzhongluo 丙中洛], where only four monks remained to take care of what had once been a major temple. The scenery here was now tropical, Rock noted, a major contrast to the cool uplands of the Mekong valley he had left a few days ago. The Salwin river had carved out a "marble gorge" with walls that rose vertically for several thousand feet. 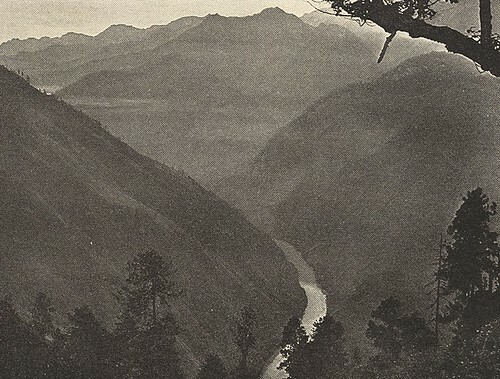 The trails was a perilous shelf in places only as wide a man's hand, which meant tip toeing sideways along the canyon, facing the wall, while the river roared below. The next day Rock climbed up to the western watershed between the Salwin and the Irrawady (presumably he means the Drung or Dulong river) to photograph the 20,000 foot high Mt Kenyichunpo阳[see picture at top of post], which he claimed was only visible in October and November. It stood on the ridge that now border between China and Burma. 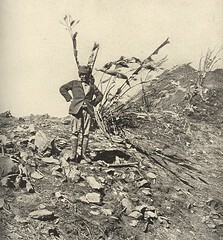 Here Rock also encountered outposts of Lisu hunters, young boys who used arrows tipped with poison from the aconite root. Across the divide he heard stories of a strange tribe, the Kjutzu, "a primitive harmless jungle people who the Chinese say live in trees like monkeys." This is presumably a reference to the Drung or Dulong [独龙] people, who are short in stature, had facial tattoos and who live in houses raised off the ground. They were for many years a kind of lost tribe, until a road was put in over the divide to connect the Drung river [独龙江] and Nu valleys. With winter encroaching, Rock then headed back towards the Mekong valley before the passes became snowed in. 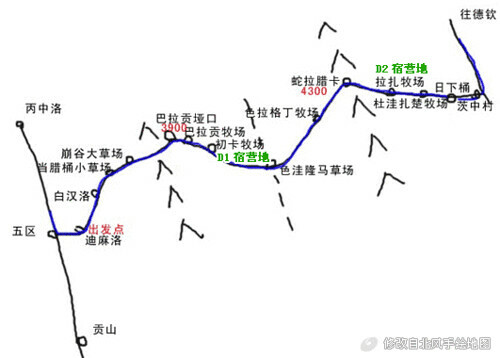 He returned down the narrow canyon to what is now the large town of Gongshan [贡山]. 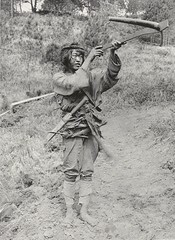 Back then he had to fire his pistol to attract attention to the locals across the river to bring their dugout canoes over to ferry him to the eastern bank. 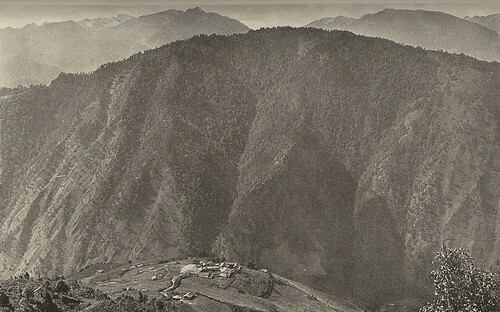 On the return journey, instead of crossing via the Sila pass, he branched off after ascending though walnut and rhododendron forests to the Salwin-Mekong dividing range. He headed into a deep valley funnelling into a narrow gorge and village called Londjre. His guides refused to go there, saying there had been an outbreak of the plague. Rock did indeed find this hamlet deserted, but on account of a plague of lice that harboured relapsing fever. This tiny settlement , deep within a dark gorge and full of disease, must have been a chilling place. "Of all the trails along which we had passed so far, none could compare with that which leads from Londjre gorge out into the Mekong. It is a veritable corkscrew up a weird black chasm, at the bottom of which roars the stream coming from the sacred Dokerla. 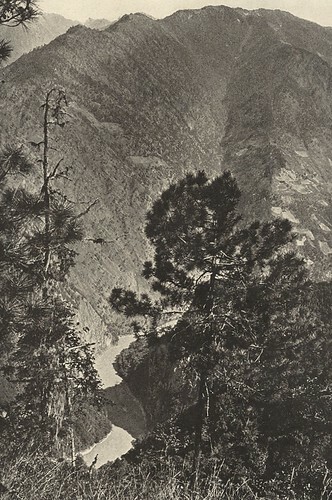 The trail is built against a rocky wall of sandstone in short rocky zig-zags, a most appalling structure of tree trunks suspended over the deep narrow yawning black canyon with overhanging cliffs. A gale was blowing in addition, which meant that one had to brace oneself against the wind, holding on tightly to the cliff." 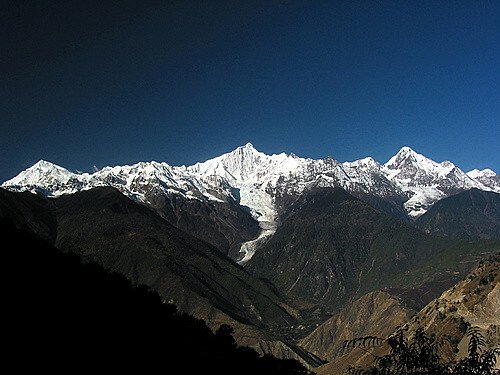 "The most glorious peak my eyes were very privileged to see; no wonder the Tibetans stand in awe and worship it. It is like a castle of a dream, an ice palace of a fairy tale, or an enormous mausoleum with gigantic steps and buttresses all crowned by a majestic dome of ice tapering into an ethereal spire merging into the pale blue sky. Next to it is a huge crest of ice resembling a giant cockscomb, then comes Kaakerpu, from which the range derives its name." 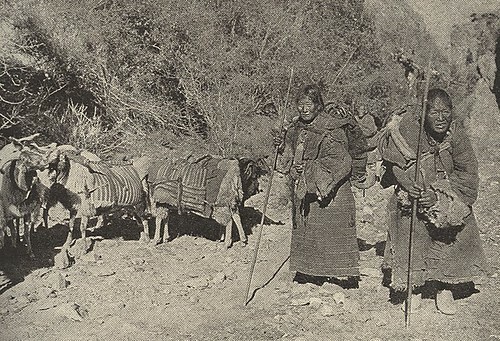 Rock made an ascent of the Dokerla from Yangtza, along with a stream of of Tibetan pilgrims. 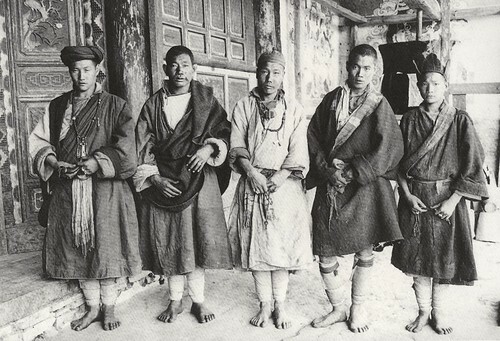 Some of these he claimed threw themselves to their deaths down the steep Tibetan side of the pass, "for to die on that sacred spot means emancipation and deliverance from re-birth". He noted that some Tibetan nuns and monks did nothing else than continually cross the Dokerla in pilgrimage, prostrating themselves on the ground and then drawing themselves up again. "It seems that the Tibetans alone of all the religious people of the world heed St Paul's admonition 'Pray without ceasing'," he noted. 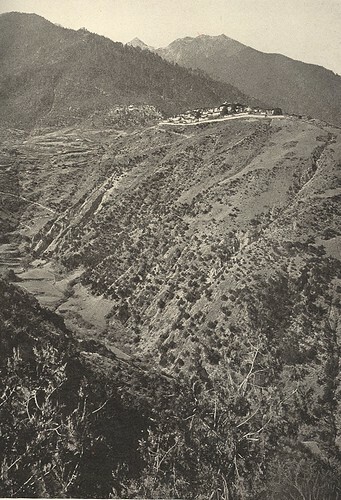 And with that, Rock returned to his Lijiang base, via the small town of Atuntze [Deqin], then an collection of flat-roofed Tibetan houses. 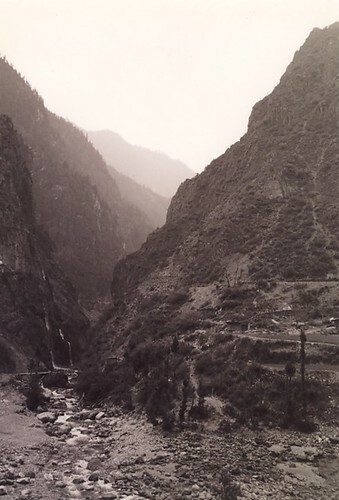 On the way back he became one of the first westerners to trek through the Tiger Leaping Gorge. 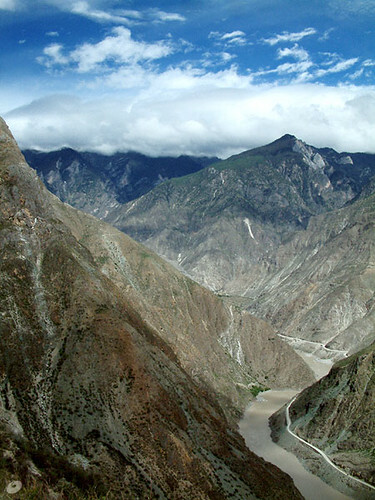 This famous tourist attraction he described as the finest of all the gorges of Yunnan, but he never mentions anything about the legend of the tiger. Little did he know that this isolated canyon spot would one day become almost as popular as the Grand Canyon in the US. The Dokerla, looking towards Tibet. 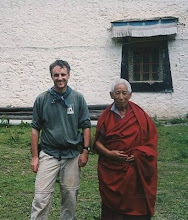 The chief lama of Champutong monastery. It was destroyed by the Chinese after the Tibetans massacred Christian missionaries in the area in 1905. Crossing the Mekong by dugout canoe, near the present day town of Gongshan.